Pattern: Canal du Midi from Nancy Bush’s Knitting on the Road . Yarn: Lorna’s Laces Shepherd Sock, denim (14ns), 2 skeins, purchased from my favorite LL supplier. Needles: set of five US 0 dpns (these ones ). Is it just me, or does everything Nancy Bush touch turn to gold?!? 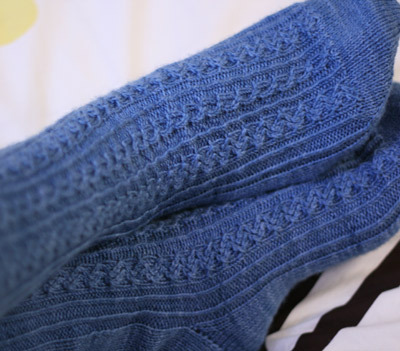 These Canal du Midi socks didn’t look particularly noteworthy in the book , but look at how nicely they knit up! The subtle variegations of Lorna’s Laces “solid” colorways keep me coming back time after time. Even though skeins from the same dye lot were used to knit each sock, see how the lower one is striping ever so slightly? Just like the Gentleman’s Fancy Socks I knit a while back. Photographing your own heels is an exercise in patience. So. The Square Heel. I don’t think it’s for me. At first I couldn’t figure out exactly where it should sit on my foot. Note to self: if you find yourself tugging the heel of a sock backward and forward for half an hour, in an attempt to determine which position is “more comfortable,” the heel style in question isn’t for you. All the tugging and pushing and squirming and questioning led me to the conclusion that the heel should be “all the way back.” After I finished the socks, something still wasn’t quite right… the fit was off, everything was too loose. Finally, I came to my senses, nudged the heel forward a bit, and decided it looked much better. “Nudging the heel forward a bit” resulted in socks fit for a giant, but that’s a small point that’s already been corrected (with a bit of cursing, of course). Even though the fit has been corrected, I’m deeply concerned that the two columns of decrease stitches are structurally very weak, and have the misfortune of residing in the most stressed area! Once they go, the entire heel will follow – the gussets wrap around to the bottom of the foot! I briefly contemplated weaving in some reinforcement thread (like here), but decided against it – if it so happens that this square heel fits my grandma’s feet perfectly, I’ll reinforce every single one from now on. But until I know that’s the case, I’ll save my time and energy for other projects :). Hmmm, I see what you mean about those heels. Strange to walk on the decreases like that. Love the cuffs, though, that pattern is really cool. Wow, what gorgeous socks…much prettier than in the book! Question tho…did you follow the pattern exactly or did you add stitches to make the socks larger? As much as I love Nancy Bush’s patterns, they are small for my large feet! Square heels are my heels of choice, since they happen to fit my own narrow heels perfectly. I put my woolen socks to heavy use, daily and in shoes and boots, worn for the best part of the day and often of the night (and I walk a lot too, at least an hour each day, often twice or trice that much, at a brisk pace). The first pair of socks I knitted with them (in a cheapo Fortissima Socka) were finished a year and a half ago, so they have been in use half of last winter and this whole winter. At a certain point I had to fix the toe of one sock: the toe shaping I used does not fit my feet and it had gone really thin, on the brink of breaking apart. The heel still hold up perfectly. YOu can feel the decrases for the first few hours, but after a couple of hours walking on them they fo perfectly flat and will never bother you again. They are also not as weak as they may seem. I am not a fan of that heel either- a bit uncomfortable. Too bad because the rest of the sock is just lovely. Lovely! I made some socks with the ame colorway last year, love the color but it really does fade like a pair of jeans. Those socks look great from every angle, and it’s hard to tell that the fit was a problem. Great work! Beautiful socks. I also do not like the band heel, but I have a wide foot. For the latest Nancy Bush socks I made for myself (Birch Leaf Socks from Gathering of Lace) I substituted a wedge heel and was very happy with the result. It’s good to try new things though, and I like having more than one tool/technique to suit the task. Very nice! I agree, Nancy Bush makes the tiniest little twisted stitches in *magic*. pretty pretty pretty! love them! the semisolid yarn works beautifully. i have the same issues with the square heel, and i have a narrow foot. it just looks bumpy and awkward on me. those are some nice looking socks, bummer about the heel. i particularly like how the subtle variations in the yarn color do not detract from the pattern. i just got a sock pattern in the mail today and it has that same heel. we’ll see how i like it. I like the square heel quite a bit, as I have very narrow heels. It seems to cup them more securely than the “regular” heel turn or short-row heels. But we knit custom socks because of the varying shapes/sizes of feet – it only follows that the various constructions fit people differently. Hope your g’ma loves them – they are quite beautiful! Lovely. They really do look very different than they do in the book. I do believe I will knit these now! Those look really pretty. I hear you on the seduction of the semisolid Lorna’s. It’s total crack. I have a pair of socks with that heel and yeah, I find myself tugging at them all the time. And they feel weird in shoes. (Good thing I tend to just wear mine with slippers.) A learning sock, so to speak. Those are fantastic, and thanks for the tip on where to get Lorna’s Laces at a reasonable price. I’m ready to get my hands on some! Especially if *that* (read: your fantastic Canal du Midis) is the result! So pretty. Thanks for stopping by the blog the other day to say hi – it is always nice to hear from you. What a great colour! I love the cables. Very lovely socks indeed. Wow, pretty socks! I think I have to put “Knitting on the Road” on my book-wishlist. Beautiful socks! I must echo Arlene’s question, though – how many stitches did you start with, especially for size zero needles? I agree…I hardly noticed them in the book! but look how beautiful it knits up! Gorgeous! I’m just finishing up the New England socks from “Knitting on the Road” and they have a square heel as well. I’m not a fan of it. I don’t like the way it looks or the fit. Maybe if you had a really narrow heel. Such wonderful socks… the color is great. Not the biggest fan of the heel, but as a whole, they are super cute! Those are so pretty – and I say that about all your knits! I seriously check them out, over & over again for tips & inspiration. The Canal du Midi socks in the book are so dark – I couldn’t tell if I would like them or not, so I never knit them – but after seeing yours in progress, I’ve given them a second look. And Nancy Bush is a knitting genius. oh, & I forgot to say that I’ve been using your Lorna’s supplier too and I adore her – she’s such a great find – thanks for passing it on! Way to go, Kathy! You saw the potential in this pattern despite the lackluster presentation in the book. So what do you get when you put a keen eye and knitting talent together a brilliant pattern and Lorna’s Laces? Grumperina’s Canal du Midi socks! they’re such a classic look. very pretty. What beautiful socks! And a great photographer too! I can’t imagine what was involved in taking pictures of one’s own feet! so lovely those socks…I’ve not tried the square heel, not sure I want to now! That yarn is special too, love it! It is unbelieveable how much better those socks look in blue. You have definitely turned me on to the semi-solid colorways! Socks are so loverly… you always do such a beautiful job! Aren’t heels a weird thing? I love to knit short row heels, but they don’t fit my feet very well. It’s quite the dilemma! But thank you for sharing about the square heel – it’s always good to hear your perspective about a technique – so informative! I have the Nancy Bush book you’re so fond of and, yes,indeed, the sock patterns are magnificent. Just now I’m knitting some 2-needle socks for my husband with a wonderful cotton yarn by Cascade with a touch of elastic. I’m not sure I’m going to be happy with the 2-needle result since, like you, I prefer knitting with 5 double-pointed needles. i can’t say i’ve ever been a admirer of that heel shaping, nor do i have that book … but you’ve given me a new interest in adding that book to my library. You deserve a pat on the back, and perhaps a muscle relaxer, for taking all of those amazing shots! These socks are lovely to behold. I have a Nancy Bush sock book that has yet to be cracked open and used. This is motivation to start surfing patterns! Very pretty! They look so much better in the LL denim than the yellow in the book. I agree with Brenda. They do look a lot better in the denim. Another beautiful pair of socks! Love the color!!! Sooo pretty. The socks are amazing. I’ll have to give the book a chance now that I see how pretty the patterns turn out. 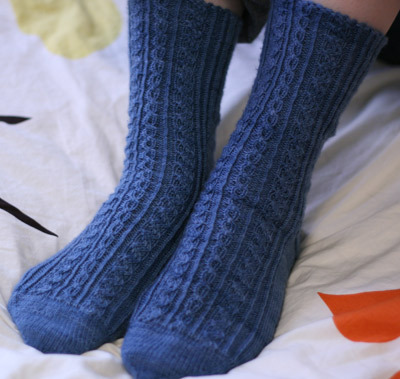 These socks are amazingly beautiful – what an awesome pattern, and I just adore the colourway that you were using! Perfect! Your socks are simply lovely! How long did they take you? I purchased that book just because of the patterns you use from it. I think it would be wonderful to see a picture of grandma sometime, after all she’s famous now (Rosa socks). Socks are absolutely amazing! How long did they take? Your socks inspired me to buy that book. Would love to see a picture of Grandma Rosa wearing her socks sometime. Lovely! I’m so glad to see a real-life example of these socks. As you said, they don’t look like much in the book and it’s hard to get a sense of what they actually look like. I usually trust the genius that is Nancy Bush, but it’s nice to get a good preview all the same. Don’t you just love socks? I enjoy Lorna’s yarns as well. Your pics are fun to look at and imagine just how you did them. Self-timer? All these beautiful socks. I just ordered some of that beautiful blue periwinkle Lorna’s Laces to make your grandma’s namesake socks. Not that I don’t have a membership in STR club and NOT that I don’t have enough sock yarn in my stash. I figure you owe me twenty bucks in change with all this tempting. And worse, I am still thinking about that melon scarf. Can you please knit something ugly. And slowly. You have the luckiest grandma ever. The socks are really lovely! Now THESE are sox! Until now, my general impression of handknitted socks has been “buffalo condoms”. Your socks are gorgeous, thanks for telling us about the heel, it’s good to know!